Evidently, nonviolent action has some kind of power, even when the action is not very spectacular. The question then arises, what is this power? Some people say, “It is the power of God,” others say, “It is the power of love.” Either answer leads to further questions, for just as the astronomer does not feel his task is done when he hears the stars defined as “the wonders of nature,” so we are not content with a philosophical description of nonviolent action. The task of this pamphlet, therefore, is to discover the how of nonviolent action. George Lakey (1938- ) is the director of Training for Change and trains activists at the Martin Luther King School for Social Change. He has helped lead a number of social change movements. In 1989, he led a team of Westerners in Sri Lanka accompanying human-rights activists at risk of assassination. He co-founded the Movement for a New Society. He founded the Philadelphia Jobs with Peace Campaign, a coalition of labor, civil rights, poverty and peace groups. He directed A Quaker Action Group when it assisted Puerto Rican nationalists who stopped the U.S. Navy from using the island of Culebra for target practice. He also founded Men Against Patriarchy, which organized pioneering projects for the early men’s anti-sexism movement of the mid-’70s. George Lakey has written six books. The latest addresses organizational development: Grassroots and Nonprofit Leadership: A Guide for Organizations in Changing Times (1996). 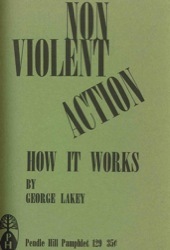 He also wrote A Manual for Direct Action (often called the “Bible” of direct action by Southern civil-rights activists of the ’60s); In Place of War; Moving Toward a New Society; No Turning Back: Lesbian and Gay Liberation for the ’80s; and Powerful Peacemaking: A Strategy for a Living Revolution. His publications are available in Swedish, German, Danish, French, Japanese and Thai. A member of Central Philadelphia Monthly Meeting, George Lakey is a father, grandfather and great-grandfather in an interracial family. He received the national Giraffe Award (1992) for “sticking his neck out for the common good,” and the Ashley Montague Peace Award (1998) from the International Conference on Conflict Resolution.